This stone now stands in the narthex of the church. When the old floor was taken up and redone they set the gravestones that were in the floor, up against the wall and covered over the graves below. Carl SabelSkjöld and Ingeborg RosenStråle. 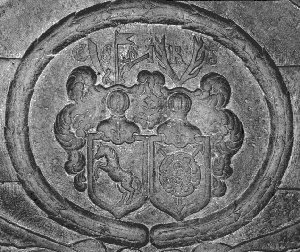 The horse, sword and pistol motif of the Sabelskjöld coat of arms and the three arrows and horns of the Rosenstråle coat of arms are shown on the shields in front of their respective representations. Här under ligger begraven Kongl. Maj:ts tro man och fordom Major utöver Smålands Cavalleri, den ädle och välborne Herren, Herr Carl Sabelsköld till Ekenäs, Bråhult, och Tompta, född a. 1590 d. 2 Januari och genom den timeliga döden avsomnade på Ekenäs 1663 d. 12 Oktober och var begraven d. 6 Martii 1664 Samt hans älskeliga husfru ädel och välborna Ingeborg Rosenstråle med deras kiära barn och Arfwingar anno 1664. 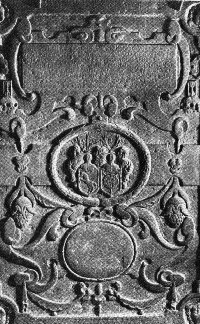 "Under here lies buried his Royal Majesty's trusted man and formerly Major of Smålands Cavalry , the noble and well-born Gentleman, Mister Carl Sabelsköld of Ekenäs, Bråhult, and Tompta , born 1590 the 2nd of January and by the temporal death fell asleep at Ekenäs 1663 the 12th of Oktober , and was buried the 6th of March 1664. Also his lovable wife noble and well-born Ingeborg Rosenstråle with their dear children and Heirs in the year 1664." &COPY;1999-2002 Gary K. Jacobson-All rights reserved. Last updated on 26AUG2003.